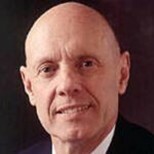 Dr. Stephen R. Covey is the co-founder and vice-chairman of FranklinCovey Company, a leading global professional services firm. He is respected internationally as an author, lecturer, teacher, and leadership mentor. His New York Times best-selling book, The 7 Habits of Highly Effective People, has sold more than 13 million copies in 36 languages, and the audio book on tape has sold over 1.5 million copies. Dr. Covey earned his B.S. degree from the University of Utah, his M.B.A. from Harvard University, and his doctorate degree from Brigham Young University. He has served as an administrative assistant to the president of B.Y.U. and a visiting professor at the University of Utah and Belfast Technical College. He has also been an officer and board member of several corporations. Dr. Covey teaches principle-centered living and is the founder of Covey Leadership Center. In 1997, a merger with Franklin Quest created the new FranklinCovey Company with over 3,000 employees and $350 million in annual revenue. FranklinCovey offers learning and performance solutions to assist professionals in increasing their effectiveness in productivity, leadership, communications and sales. Dr. Covey is the recipient of a number of awards, including the Thomas More College Medallion for continuing service to humanity and the 1994 International Entrepreneur of the Year Award. He has also received seven honorary doctorate degrees and has been recognized as one of Time’s 25 most influential Americans. • Each of us tends to think we see things as they are, that we are objective. But this is not the case. We see the world, not as it is, but as we are—or as we are conditioned to see it. • Effective people are not problem-minded; they’re opportunity minded. They feed opportunities and starve problems. • Without involvement, there is no commitment. Mark it down, asterisk it, circle it, underline it. No involvement, no commitment. The 7 Habits of Highly Effective People was a popular book when it was first published in 1990, and it continues to be a business bestseller 13 years later. It is the best place to start with Stephen Covey. The book was already extremely successful when I first started reading it, and Stephen Covey was highly respected in personal and business development. Initially, I expected to read it quickly and walk away with some random, quick tips. But the book really provides detailed information to enable anyone to change their life. The “7 Habits” are included in the “Quotes and Thoughts” section above, but the magic comes in the implementation of these habits, not in the reading of them. Dr. Covey writes about the “paradigm shift” required to truly change your life. According to Dr. Covey, you need to actually change your perception and interpretation of how your world works. His system and habits work to enhance both your personal and professional life and provide a holistic, integrated, principle-centered approach for solving problems. Bottom line—the habits work.